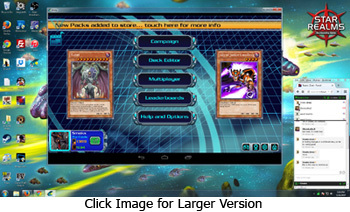 As previously reported on this site, some people have been able to successfully play the Android version of Yugioh Duel Generation on PC using the Blue Stacks Android emulator. Blue Stacks emulates the Android Operating System on your PC. Emulation is system intensive and as a result requires very powerful/modern hardware. Some users have reported random stability issues using this method such as crashes and freezes, while it seems to function well for others. After doing some (preliminary) testing I have found a another way: Andy OS. Instead of trying to emulate android on your PC, Andy creates a virtual machine on your pc and installs an actual copy of android to it. This is all done seamlessly, and after installation you are left with a "Start Andy" shortcut that launches the virtual machine and android in a window. From there you have only to setup a google account if you don't already have one then open the google play store and install Yugioh Duel Generation. After installation, click the circle with 6 dots in it located on center/bottom to get into the app drawer, click the "uncategorized" tab, then click and hold the Yugioh Duel Generation icon in order to put a shortcut on your android desktop. I have previously tested Yugioh Duel Generation on my PC using Blue Stacks and found it functional but slow. Additionally, Blue Stacks funds its self by installing some shovelware on your emu when you first install it (making for a very long install time). This additional software can easily be removed, and some users have reported better performance when using Blue Stacks than with Andy OS, and vice-verse. Andy OS is based on free software and is free with no strings or bs. I have an older PC, an Intel i5 660 @ 3.33Ghz (dual core) and the performance of Yugioh Duel Generation on Andy is AMAZING. It looks great in a big window, and it runs MUCH faster and smoother than it does on my quad-core Asus Nexus 7 Android tablet. If you want to play Yugioh Duel Generation on PC I highly recommend you try Andy OS. The site mentions that a version of Andy is available for Mac. I have not tested this, if you have please contact me via chat or pm. - Click the Google Play Store icon (white shopping bag), search for Yu-Gi-Oh! Duel Generation and click install. - After installation, click the circle with 6 dots in it located on center/bottom to get into the app drawer, click the "uncategorized" tab, then click and hold the Yugioh Duel Generation icon in order to put a shortcut on your android desktop. 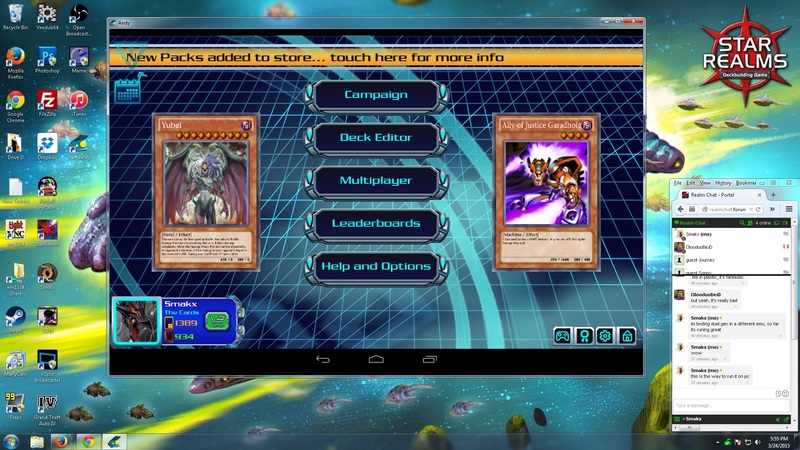 - If you have been playing Yugioh Duel Generation on another device, make sure you log out on that device before logging into the game through your copy in Andy. This is true any time you switch from one device to another to play the game.